These heartbreaking photos capture the devastating impact California’s worst-ever wildfires have had on pets in the state. The horrific images show singed cats, dogs, rabbits and other animals after they were caught up in the encroaching inferno. The wildfires have claimed the lives of 42 people and have caused untold destruction as they spread across the state. Thousands of residents have been evacuated from northern California’s Camp Fire, and the Woosley Fire, which has raged near Malibu in the south, as firefighters desperately attempt to quell the flames which have been fanned by high winds. 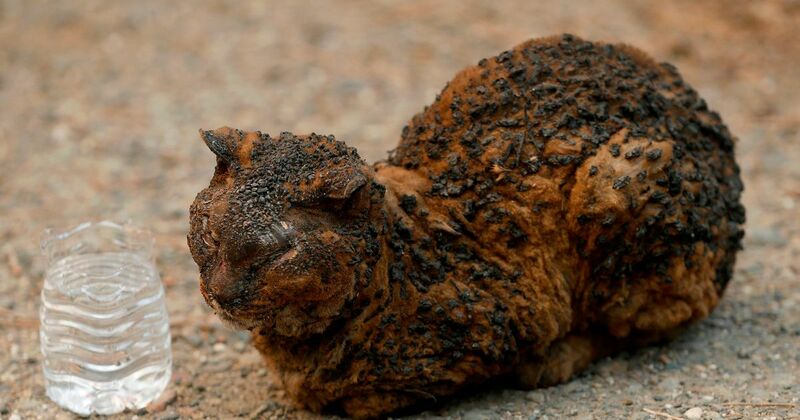 But a poignant image of a singed cat with its eyes burned shut has also rocked the community. Another reveals a pet rabbit with its ears and fur blackened from the flames. The cat, which was discovered on a roadside near Paradise, was just one of the animals treated at a makeshift veterinary clinic at Butte County Fairground, 30 miles south of the Camp Fire’s path. Sadly, it passed away from its injuries. Volunteers from the Ventura County Animal Service and UC Davis Veterinary Emergency Response Team were able to help the injured pet rabbit along with dozens of other dogs, donkeys and farm animals, including goats and geese. Birds, snakes, raccoons and squirrels have also been treated, rescuers say. Celebrities including Khloe Kardashian and Ariel Winter slammed a wine estate in Malibu for allegedly abandoning a giraffe. Pictures show how workers at Saddlerock Ranch left the giraffe to his fate as acrid smoke billows in the background. So far it is estimated several thousand pets have been killed as a result of the wildfires. Northern California, which has vast expanses of woodlands, is home to numerous wild animals including deer, black bears coyotes and bobcats, and it is feared many of these creatures have also been killed. Most of the Camp Fire’s destruction and deaths occurred in and around Paradise, a town of nearly 27,000 people that was virtually destroyed overnight Thursday, just hours after the blaze erupted. Some 52,000 people remained under evacuation orders, Authorities said on Monday. This makes it California’s deadliest ever wildfire, surpassing the death toll of 29 in the 1933 Griffith Park blaze in Los Angeles.